Vampire, an imaginative creature appeared in many great movies, novel and legends has a large market in these days. Many people have been seduced by this dangerous blood-sucking lifestyle. 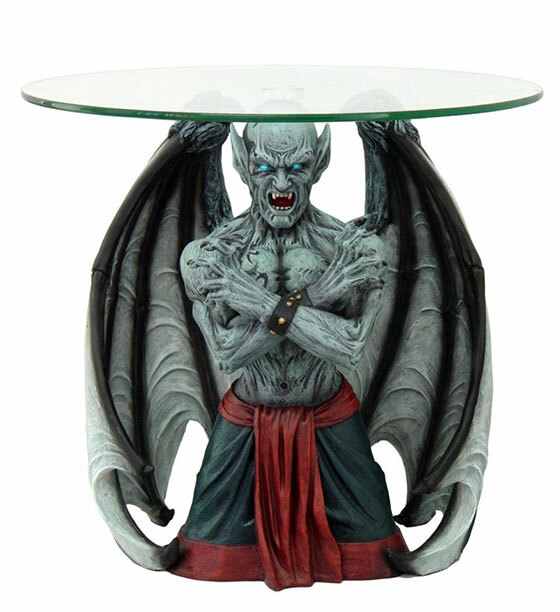 They are not only dress up like vampire during special day like Halloween, but also decorate their home with these monster-inspired products. There are many interesting options available, from tiny ice tray to a sculptural side table, from wine holder to tabletop fountain. Take a look at these blood-curdling monster products and you might find them useful in the coming Halloween season. 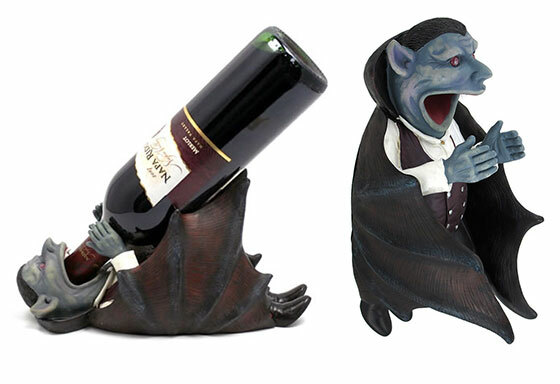 This cool new Vampire Wine Bottle Holder depicts a boozy vampire sucking down on your favorite bottle of vino or any other spirit in a standard 750ml bottle. A hilariously spooky way to store your wine this Halloween season. 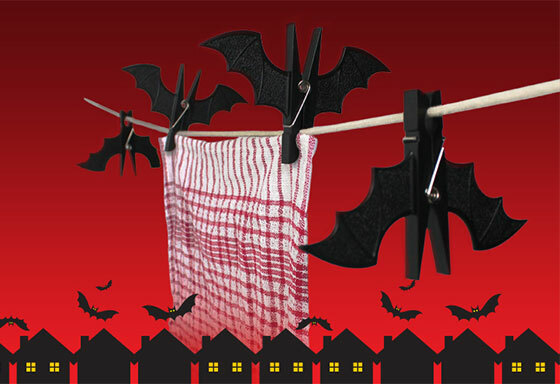 These cool new Spooky Bat Clothespins are little vampire bat-shaped clips that hang upside down when not in use and upright when hanging wet/blood-soaked clothes from a clothes line or just anything around your haunted house. Simply screw it to the top of your bottle of tomato sauce and squeeze! The Ketchup will come through the fangs, for a horrifyingly good effect. This ultra cool vampire skull table top water fountain is the perfect addition to medieval decor, and its small size makes it perfect for any table, nightstand or bookshelf. 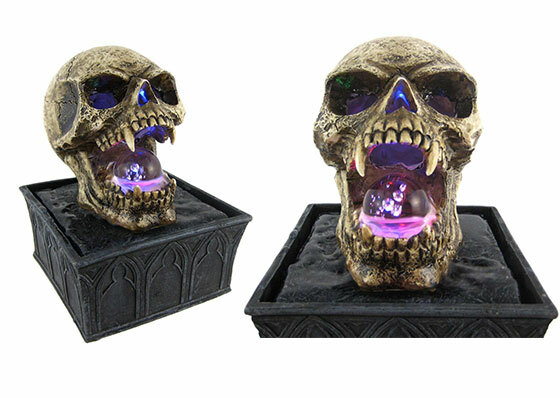 Made of cold cast resin, this fountain features an evil looking skull, its open mouth holding the glass orb from which the water emerges. LED lights under the orb change in color from green to red to blue. It measures 5 inches long, 5 inches wide and stands 7 inches high, with incredible detailing in the features of the skull. 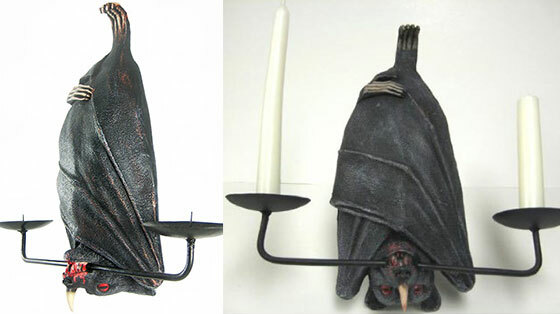 This incredibly cool Vampire Bat double candle holder hangs from the ceiling by a J hook (not included). 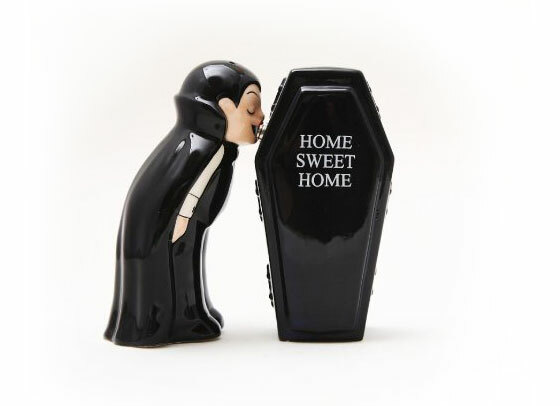 It makes an excellent Halloween decoration, but also makes a great gift for anyone into the macabre. Measuring 11 inches long, 11 inches wide and 3 inches deep, the bat has amazingly realistic features, from the pupils in his eyes to the blood on his lips. The metal candle holder trays have spikes to hold the candles firmly in place. 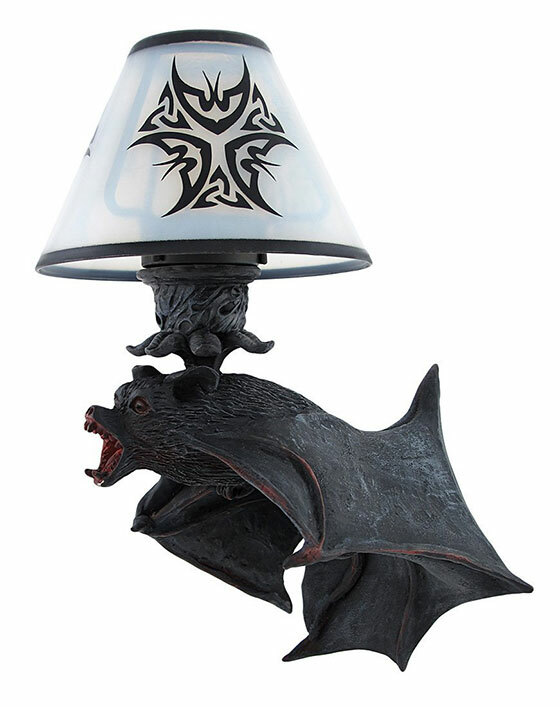 Uniquely lit from the inside, this lamp creates eerie shadows as it casts a macabre glow from behind the menacing creature?s bat-like wings and onto your walls. 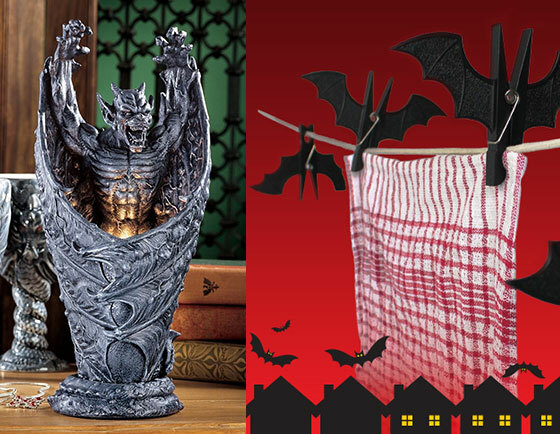 When lit, this ghastly vampire bat candle lamp will dispel the shadows with a warm flickering glow. 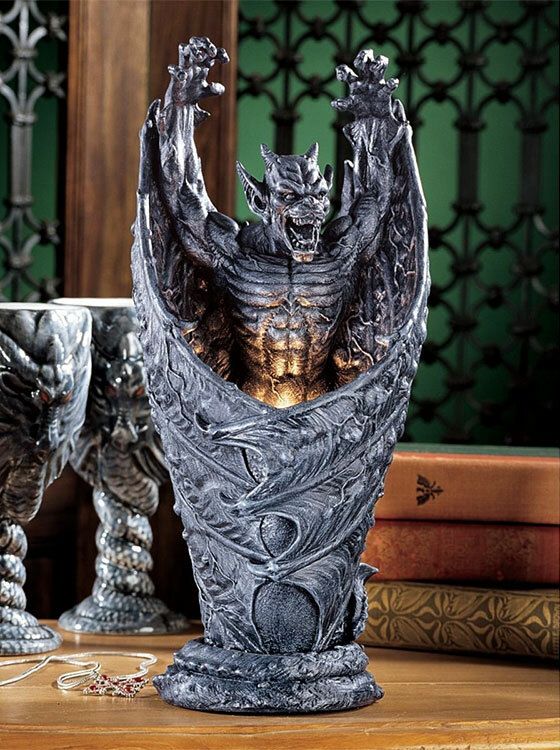 Made from cold cast resin, the figure has a black matte finish with blood red accents in its bared fangs and bony wings. The black metal candle fixture holds tea light candles up to 1 1/2 inches in diameter and is covered with a translucent plastic shade which glows over a flame. The sinister lamp hangs from any wall via a hanging slot on its flat side. This stunning piece will make a great addition to any gothic art collection.